The humble date stamp is surprisingly still very much relevant today, in spite of the advancement of administration technologies. 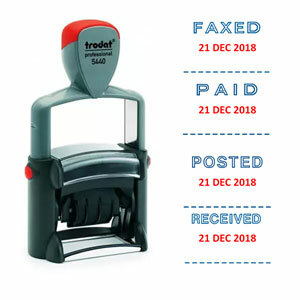 A date stamp is basically a marking device that contains a date component, which one uses to transfer a printed image of the date onto a document or package. Usually the marking device is a rubber stamp of some format. Stamps Plus offers various products in the category of date stamps. Some are self-inking devices and others are traditional styled ones which require a separate ink pad. Furthermore, some of the self-inking date stamps are designed for office use while some are built with steel components for high demand usage in the industrial environment. There are yet even further sub-categories of date stamps where, for instance, the stamp might feature just a date component whilst others feature both date and text. Many of the date and text combinations are in such high demand, that these models have a variety of stock texts or phrases to choose from. A lovely feature of the modern date and text stamp combination is where one can have customised text and/or images. There are literally so very many choices and options. Steps and processes in obtaining the right date stamp. View our web page of families and examples of date stamps. Some feature ‘Dater-only stamps’, ‘Date with pre-determined text’ and ‘Date with customisable text’.